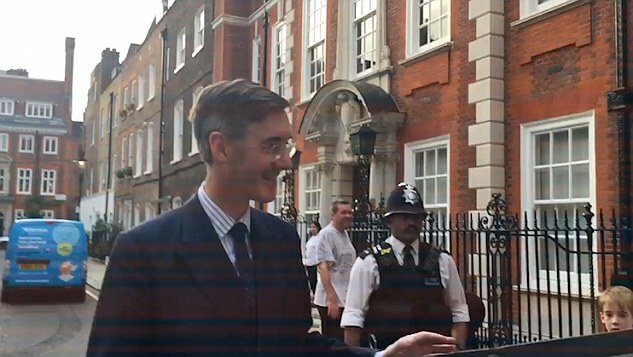 Class ‘activists’ launched a sickening tirade at Jacob Rees-Mogg’s children – including his six-year-old son – telling them their daddy is a ‘totally horrible person’. 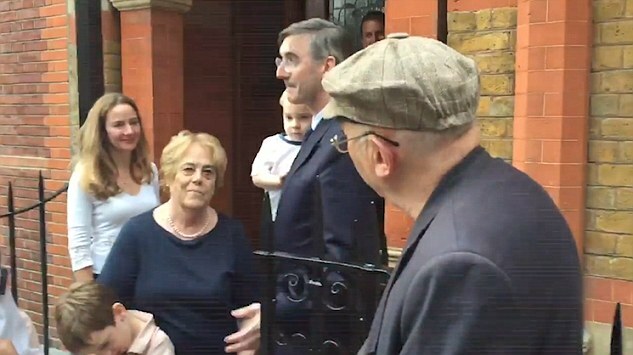 The three youngsters stood stunned while their parents tried to usher them inside, but they still heard the full bullying rant demanding to be told how much the family’s long serving nanny is paid. 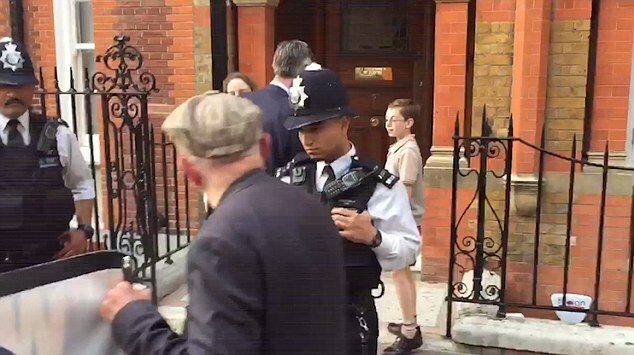 Activist Ian Bone, wearing a flat cap and leaning on a stick, was filmed shouting: ‘Your daddy won’t answer the question. ‘Your daddy is a totally horrible person. 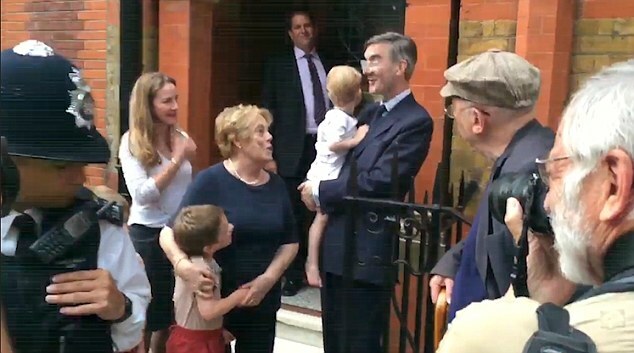 The encounter last night involving the Rees-Mogg’s nanny Veronica Crook – who has been with the family for decades and cared for the MP when he was a boy – lasted several minutes. It was filmed by left wing activist group Class War and posted on their Facebook page. 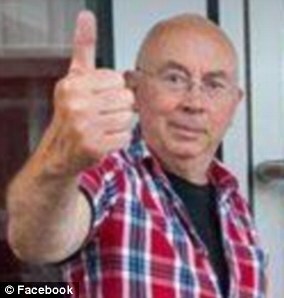 When questioned by MailOnline last night, despite his apparent willingness to bring Mr Rees-Mogg’s children into debate, Mr Bone refused to say how many grandchildren he has or how old they are. The Prime Minister’s official spokesman condemned the confrontation of Mr Rees-Mogg as ‘completely unacceptable’. Others, including Tory MP Ben Gummer, whose father John was Environment Secretary in the early 90s, were equally horrified by the encounter. Even Class War’s own supporters online found Mr Bone’s direct attack on the children too much. Steve Cason wrote on Facebook: ‘I think taking the Tories on is fair game and in fact must be done – I do it all the time. He later sought to play down the incident, insisting his children were ‘absolutely fine’, despite the barracking. ‘I wouldn’t get too excited about it. It was a few anarchists who turned up and it wasn’t very well organised. It wasn’t terribly serious,’ he told LBC radio. ‘We are a free country. They weren’t violent. They aren’t admirers of mine. I am in public life and not everybody is going to like me. That is a reality of public life. During the confrontation Mr Bone, 71, told the children: ‘Daddy won’t say how much he pays your nanny, his nanny who looks after you. Daddy doesn’t pay her very much. ‘Daddy says the minimum wage doesn’t count for anything, or the London minimum wage. ‘Daddy doesn’t pay nanny much, so poor nanny Crook who looks after you and wipes your bottom, she doesn’t get enough money every week. She emerged and said that she wasn’t paid by the hour and that she didn’t need to tell him how much she was paid as she hugged Mr Rees-Mogg’s son. Mr Bone was not put off and went on to accuse Ms Crook of having ‘Stockholm syndrome’ because she wouldn’t reveal her salary. 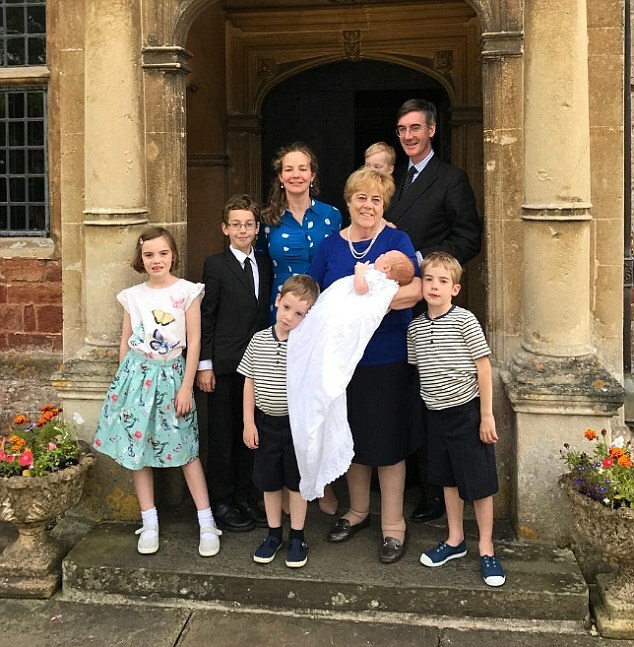 Ms Crook, who regularly appears in family pictures, looks after all six of the MP’s childrenand has been connected to the family for half a century. Today, Mr Bone, who has Parkinson’s Disease, walks with a stick and whose father was a butler, was unrepentant about speaking directly to the children. 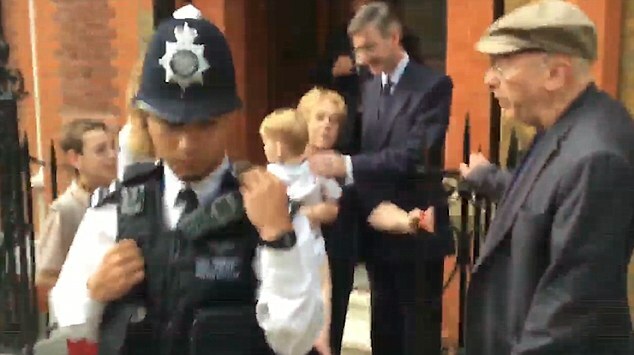 He told Mail Online: ‘Jacob Rees Mogg brought his family outside and into our demonstration. I stand by everything that I said. ‘I think that my comments to his children are nothing in comparison to the policies that Rees Mogg believes in. 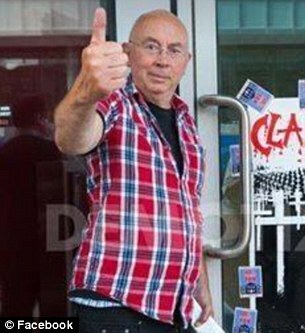 Veteran activist and grandfather Ian Bone, 71, was once dubbed Britain’s most dangerous man after the Class War newspaper he launched in 1982 became so incendiary it featured pictures of beaten up policemen. The full-time anarchist – who’s been on state benefits since leaving university – now walks with a stick thanks to Parkinson’s disease. After his unabashed assault on the Rees-Mogg family, the father-of-five remained unrepentantly silent about his own family. Having taken the fight down to a personal level, he will not discuss his own children – or even grandchildren, instead using the media spotlight for his own political message. ‘Jacob Rees Mogg supports policies such as benefit reforms for the disabled and the new welfare system Universal Credit, where there have been cuts and delays in payments to the most needy. ‘If I was Rees Mogg, I wouldn’t have a problem with my children being told that I’m a horrible person. I could have said far worse. Bone has been protesting since the 1980s and is a publisher with class activist publications, Class War and The Bristolian. Class War became a class movement as well as a newspaper, which at its height sold 15,000 copies weekly and supported striking miners, dockers, print workers and demos including the Brixton Riots of 1981, before the publication was launched. Bone went on Bash the Rich marches (Bash the Rich is also the title of his autobiography). Just a decade ago he advocated violence to overthrow the state. While still a weekly paper, Class War dubbed itself ‘Britain’s most unruly tabloid’. After Prince William’s birth in September 1984 it carried a front page picture of him with the headline ‘Another f***ing royal parasite’. Another front page carried an image of Margaret Thatcher with a hatchet buried in her head. When the paper folded, it carried on as a pressure group. Bone admits to having a working class hatred for the rich as his own father was a butler. He lived in Grenfell from 1983-1986 and knew several residents who were caught up in the fire there where 72 people died. He went on to protest outside The Shard when Grenfell residents weren’t being re-housed as there were 10 £50m empty luxury flats inside the state-of-the-art tower. Bone was taken to the High Court by Qatari royal family, owner of The Shard, in February this year to stop his protests before their lawyers withdrew their threat of an injunction against him. 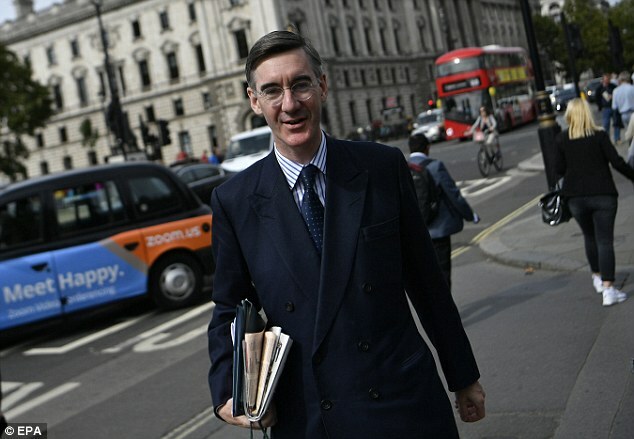 Jacob Rees-Mogg praised his ‘remarkable’ nanny of 51 years at the birth of his sixth child Sixtus in July last year. 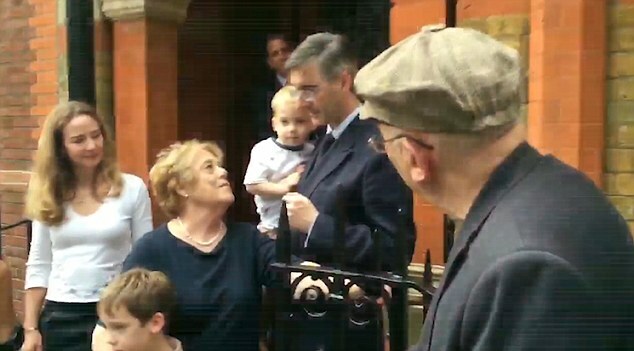 The Brexiteer Tory MP has known Veronica Crook since birth and now despite being aged in her 70s she is looking after the next generation of Rees-Moggs. Miss Crook once famously campaigned with Mr Rees-Mogg in his mother’s Mercedes. 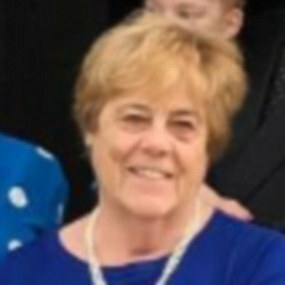 The MP for North East Somerset told MailOnline at the time that Miss Crook has been working for the Rees-Mogg family for more than half a century and ‘she is still on duty’, looking after his latest addition. He said: ‘Nanny is still looking after the children, which is absolutely wonderful as I hear her telling them things she used to tell me. Previously, Miss Crook has described the young Jacob’s behaviour as ‘perfect – or for most of the time perfect’. 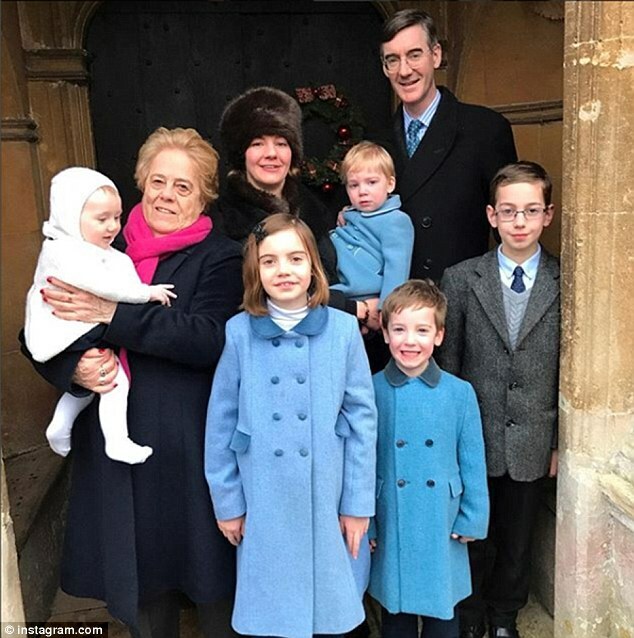 Mr Rees-Mogg said his six children are as ‘informed’ about politics as he was as a child and regularly join him on the doorstep.